Protect your horse from the harmful effects of chewing, gnawing AND cribbing! 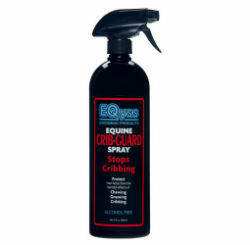 CRIB-GUARD is a long-lasting anti-chew spray that is guaranteed to stop your horse from chewing and cribbing! Safe for all surfaces, including: wooden, plastic or metal fences and stalls, blankets, wraps, bandages and any other surface your horse desires to chew. Will not irritate skin and will not harm vegetation. Will not irritate skin. Will not harm vegetation. Alcohol free. Safe for all surfaces including leather. Will not stain blankets or wraps. Avoid costly vet bills, dental injuries and digestive tract problems.